I had forgotten that I hadn't blogged about this yet! I'm very pleased - it's a new sweater. 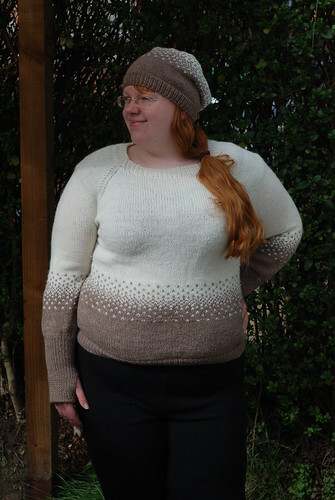 The pattern is Katie, a top-down raglan with a colorwork band and a few other thoughtful details. The yarn is called Ethical Twist - a 70/30 wool/alpaca blend. It's sadly discontinued - it has just enough alpaca fuzz and softness, while still being light and elastic. Plus it came in all natural colors - the brown, called 'Mink', is this fabulous heathery brown that I really love. If you can find it, I recommend it (and you might be able to find it at a discount). I also added the colorwork motif to the sleeves - the original pattern just has totally plain sleeves in one color, but I wanted more balance between the light and the dark. It was a fun knit - I thought the stockinette would get boring, but the small amount of colorwork did a great job of breaking up the monotony. It knit up quite quickly. My favorite bit of the sweater has to be the thumbholes in the sleeves. Ideal for cold weather - I finished the sweater just before the last cold day of winter, and loved rolling down the sleeve cuffs when I went outside. It's really cozy. I also made a matching hat, with which I am somewhat less enthused. Maybe I didn't shape it right, or maybe the slouchy look just doesn't suit me. Ah well, live and learn. I'm really thrilled with the sweater anyway! Fun knit, good fit, lovely yarn. What more can you ask for, really? I think your sweater looks great! 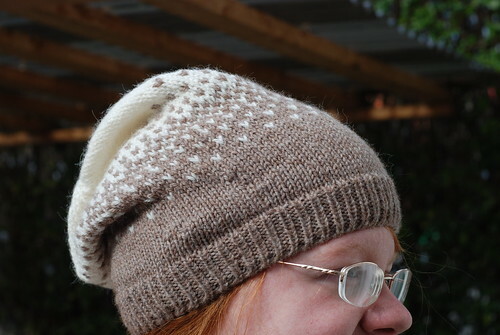 The matching hat is a nice tough, sometimes slouch hats just need a little while to stretch out a bit more before they start to feel like they look right (at least on me).